沙特阿拉伯，利雅得，阿卜杜拉国王石油研发中心 / 扎哈·哈迪德事务所 - ArchGo! 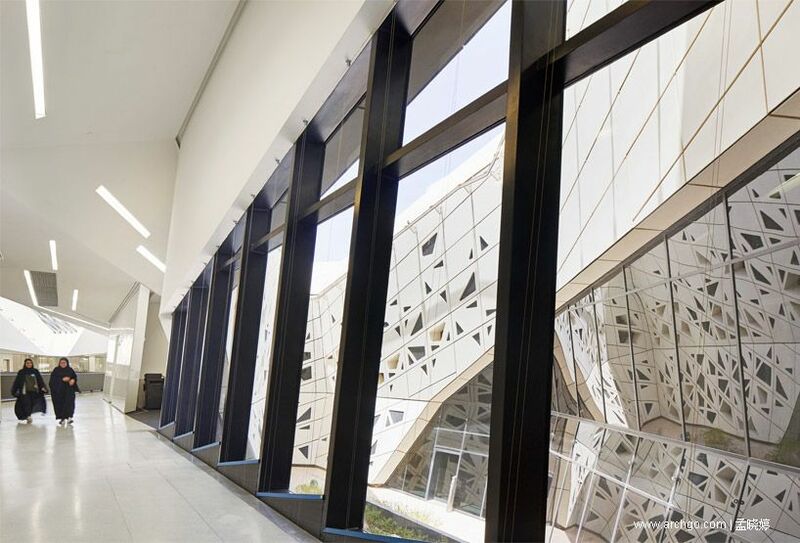 in the saudi arabian capital of riyadh, KAPSARC (king abdullah petroleum studies and research center) has opened its expansive 70,000 square meter campus to the public. the project — first unveiled in 2014 — was designed by zaha hadid as a modular structure that grows and multiplies like a living, organic cell. 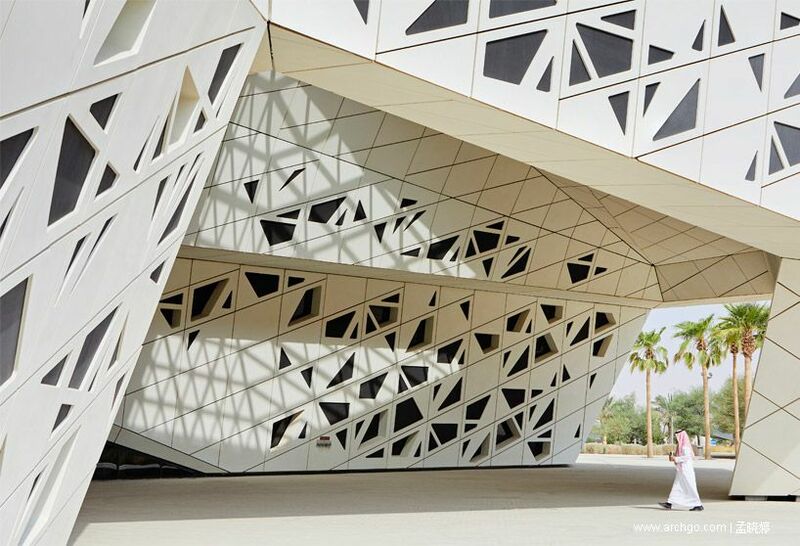 the result is a series of seemingly crystalline-like structures that emerge from the desert landscape. hexagonal prismatic honeycomb shapes connect each of the five buildings — the energy knowledge center; the energy computer center, a conference center with exhibition hall and 300-seat auditorium; a research library; and the musalla, a place for prayer. 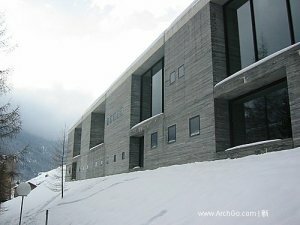 the project’s design, as a compressed configuration of lattice cells, reflects the institute’s forward-looking philosophy. 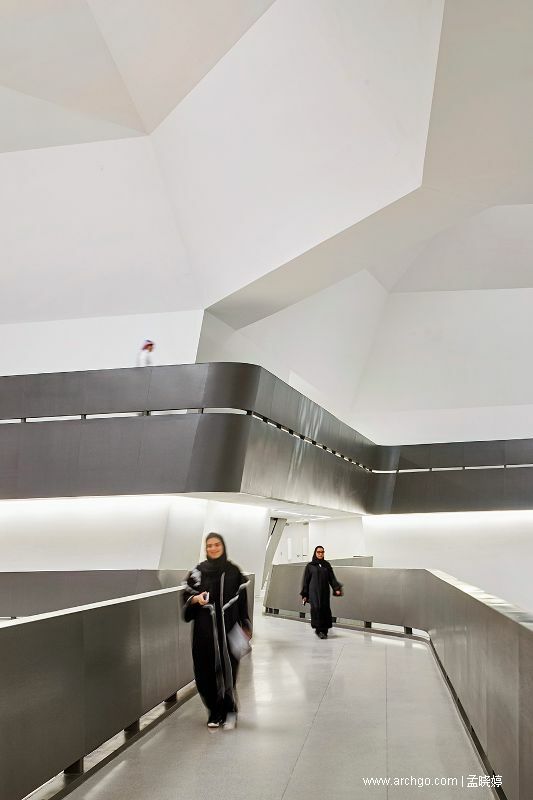 created by zaha hadid architects, the structure’s modularity ensures consistent organizational, spatial and structural strategies as the site expands with more buildings. 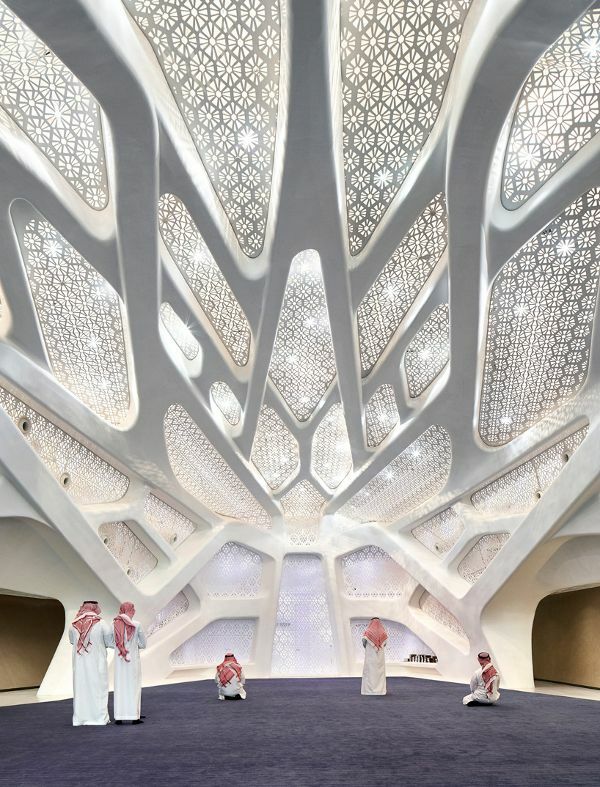 furthermore, its white, crystalline-like form contributes to softening the strong sunlight and heat of the riyadh plateau. KAPSARC is a non-profit institution for independent research into policies that contribute to the most effective use of global energy. it develops policies and economic frameworks that aim to reduce the environmental impact and overall costs of energy supply and enable practical technology-based solutions to use this more efficiently. by collaborating with international research centers, public policy organizations, worldwide government institutions and global industry, the institution brings together leading experts from around the world to tackle energy challenges; freely sharing its knowledge, insights and analytical frameworks. the campus shields itself from the region’s intense southern sun, but remains open to the north and west — a configuration that not only encourages prevailing winds to cool the courtyard, but also offers the potential for future expansion to the north of the site. 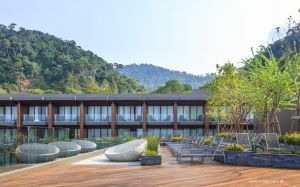 furthermore, ‘wind-catchers’ integrated within the roof profiles on the southern sides of each courtyard catch the prevailing winds from the north, cooling each courtyard. meanwhile, an underground link connects the main buildings for use at the hottest times of the year. 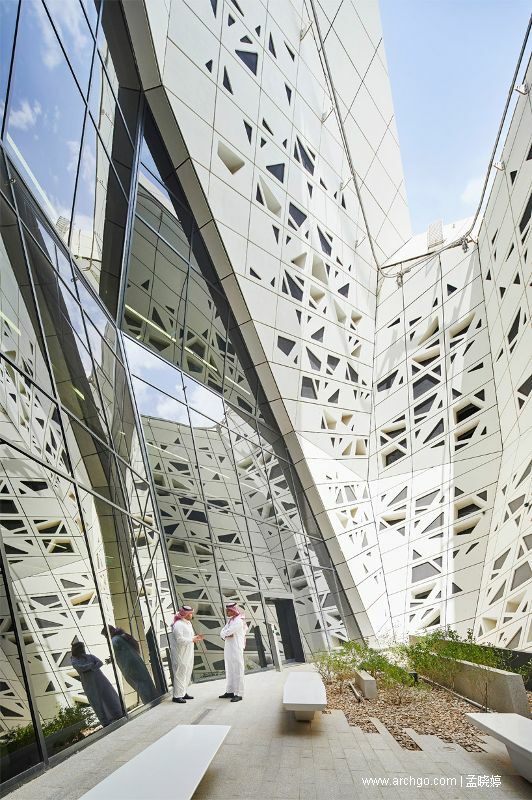 through its passive and active environmental solutions, KAPSARC has been awarded LEED platinum certification from the united states green building council (USGBC). this includes a solar photovoltaic array located on the roof of the south-facing conference center with a capacity of 5,000MWh/year, while all of KAPSARC’s potable water is recycled and reused on site and 100% of irrigation water is from non-potable sources. 40% of the project’s construction materials have been sourced from within 500 miles, and 30% of materials made with recycled content. internally, specific hexagonal cells strategically located within each building are left open to create a series of sheltered day-lit courtyards. by strategically off-setting floorplates and offering views between floors in public areas, the complex has been designed to promote transparency and encourage an active exchange between researchers and visitors. 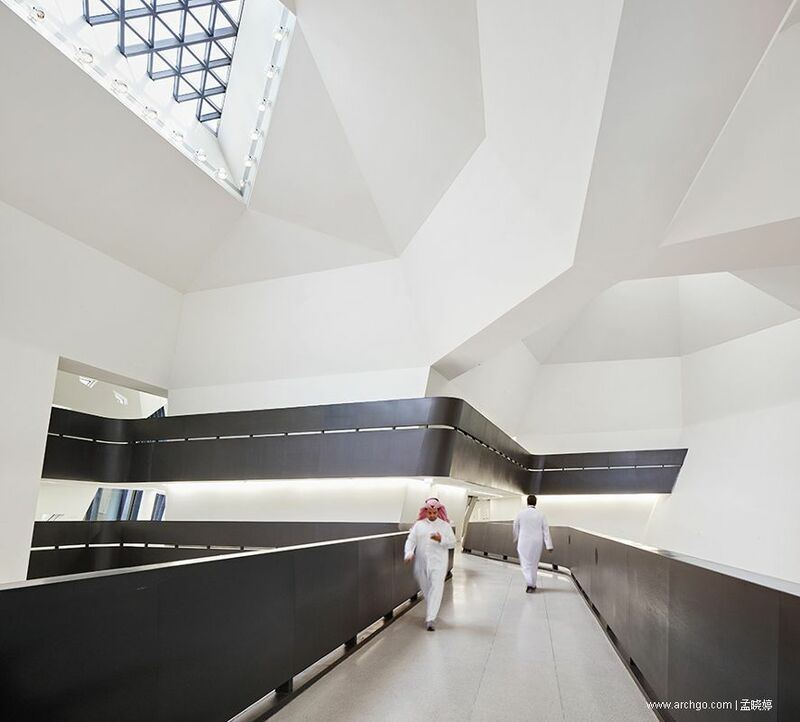 as a forum of innovation and collective research, KAPSARC’s convention center recently hosted its first major public conference, with more than 20,000 visitors attending saudi design week 2017.